Not a darn thing in my opinion! were as dear to us as our pet dog. Zuki taking one of our pet roosters for a walk. Time and time again municipal authorities showed up on our property unannounced to "inspect" our pets. We showed them that our birds would go in their house on command, walk on a leash, they were clean, tidy and treated better than many of the roaming cat and dog pets in our neighborhood, several of which frequently trespassed on our property to defecate on our lawn and in our flower beds. Yet all that aside council stated that the roosters were farm animals and our half acre of residential property was not suited to having farm animals. I also pointed out that the one complaining neighbor frequently drove a "farm" tractor on our residential roads and parked it in his driveway - So what the heck was up with that? Reading through the municipal guidelines we discovered some very interesting points. First of all we were not permitted to have "farm animals", but you need to have a "farm" to have farm animals - Right? We clearly have a very well kept residential property and not a farm. Another thing we found was that under the agricultural definitions, farm animals were described in units. For example 1 horse was an animal unit and interestingly enough 100 chickens was an animal unit...yes 100! 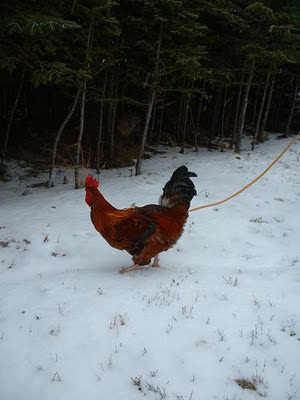 So therefore we did not have a farm animal unit as we only had a total of 7 pet roosters - a far cry from 100! This combined with our intent for our animals was proof enough that we did not harbor farm animals on our residential property. We had no intentions to eat our pets or profit from them in any way - Heck no! Lets remember that a chicken is a bird like any other bird. They can be trained, are smart and are clean...No different than a parrot. What defines a pet? "A domestic or tamed animal or bird kept for companionship or pleasure and treated with care and affection"
What defines a farm animal (livestock)? "Livestock refers to one or more domesticated animals raised in an agricultural setting to produce commodities such as food, fiber and labor. ...any animals kept for use or profit"
What about other types of pets? Potbelly pigs - are they farm animals? Rats? Maybe people who keep pet rats are running a commercial labratory operation, since a large portion of the rat population is used in this manor? What about goldfish or Koi? If you keep those is it a fishing or aquaculture operation? And people who sell a few kitens? Isn't that profiting from animals? That should be the end of it. Whatever the animal is, if it is cared for, tame and treated as a pet and is not raised in an agricultural setting and used for profit - then it is not a "farm animal" and is indeed a pet. We took this information to the provincial hearing and it was decided that our roosters could roost in our residential area! So we could finally rest easy and so could our roos! Recently, I learned of a man in Nova Scotia, Alex Loomer, he and his family are going through the same ordeal, this hits a sore spot with me as I think it is utterly ridiculous that people can be harassed over the type of pet they keep! Alex Loomer has been ticketed by the county for violating its bylaws, which state that raising fowl and other farm animals is not permitted in a growth or residential area. Loomer owns a 12-hectare property on the Marshall Road, little more than a stone’s throw from the village of Kingston, a desig­nated growth area. The county has told him to remove his feathered friends. He has refused. He’s also been ordered to appear in court on Feb. 16 to answer to the charge. In the meantime, he’s subject to a fine of $226 per day for every day he disobeys the order. What the Heck?! He plans to represent himself in court. “It’s crazy," Loomer said Wednesday. “Wouldn’t you think they’d have bigger priorities?" Loomer has lived in the same location for 49 years. He has a small-machine repair shop on the property and has neighbours on both sides. Noting that he pays his taxes, he said he feels his property rights have been violated. “I can’t get rid of them because it’s a death sentence," he said as three roosters followed him about his workshop. Given as an Easter present last April to his 12-year-old daughter when they were day­old chicks, Loomer said his little girl would be devastated if the birds were destroyed. 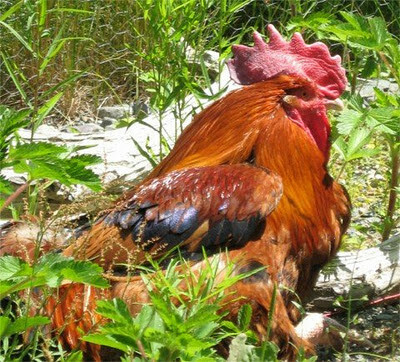 The fowl are kept in a nearby coop when they’re not pecking and scratching at his feet or resting on his shoulder. “They’re pets," Loomer said. “That’s all they are. We’re not involved in agriculture whatsoever with them." 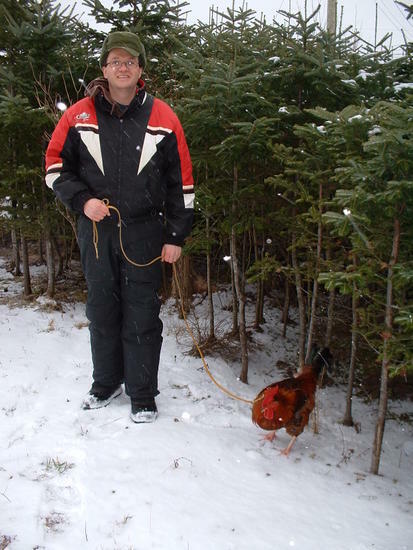 I wish Alex and his chickens (acey, raven, rocky, flame and flash) all the best and hope they win their day in court! Please help them and others have the right to keep chickens as pets, more chickens in the world deserve the right to be pets! Raven could be taken from his Kingston home because of a county bylaw. Please take the time to help Alex and his chickens by signing the petition about and sharing this with others!